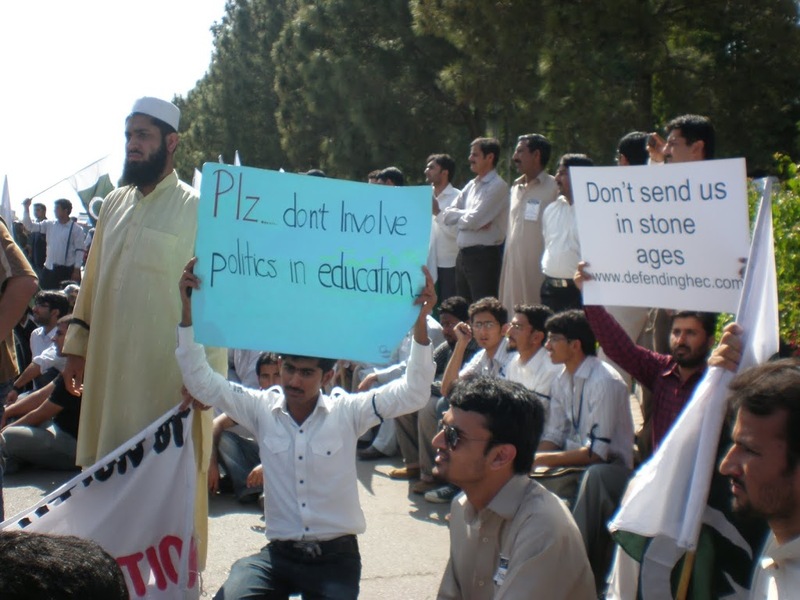 ISLAMABAD: Hundreds of students and scholars took to the streets on Tuesday to protest against the devolution of Higher Education Commission (HEC) and vowed to continue protests till the government shelved the plan of devolving the HEC. The protesters gathered at Press Club Islamabad and marched to the parliament building near D-chowk waving hundreds of national flags, holding banners and placards while chanting the slogans ‘Save HEC, Save Education, Save the Pakistan’ and ‘Don’t send us back to stone age’. As the activists reached D-chowk, the policemen prepared themselves to counter any possible undesirable incidence. However, the student protestors prepared a chain of hands in order to give an impression of an organized demonstration. 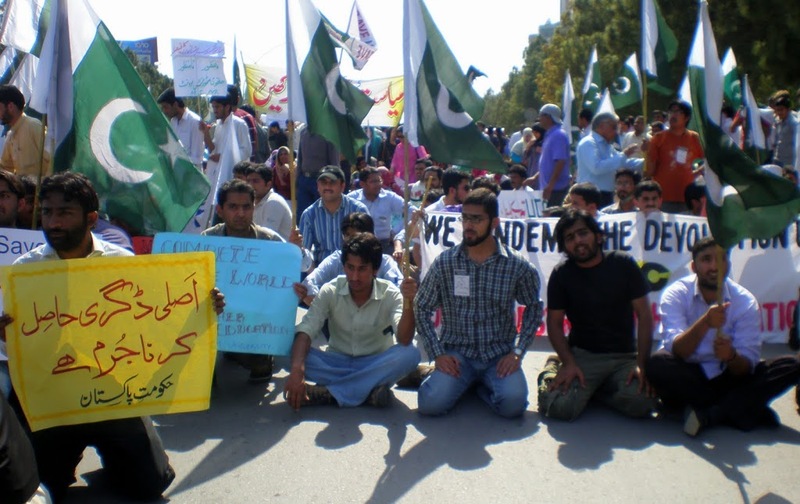 The students of Quaid-i-Azam University (QAU), Bahria University, National University Of Modern Languages (NUML), International Islamic University (IIU), Foundation for Advancement of Science and Technology (FAST), COMSATS Institute of Information Technology (CIIT), Allama Iqbal Open University (AIOU) took part in ‘Defending HEC – Taleem March’ (Education march). Scholarships, merit, value of student degrees were few of the doubts in the minds of protesting students. “HEC is recognized as a bona fide degree recognition authority worldwide and if an alternate organization is formed, it will take another 8-10 years to give us a similar status” highlighted Bilal Hasan Kirmani, a Bio-informatics student at COMSATS. Marvi Memon (MNA of PML-Q) also participating at the march said that the Supreme Court’s decision “to restore all privileges of HEC and keep it operating until the amendment in the law”, actually support the cause of the protestors. “The parliament should have taken this decision to restore HEC but sadly there started an unending debate in the parliament instead of a clear verdict” Marvi told Pakistan Observer. Maliha, an HEC scholar of engineering observed that the system of HEC “was based on merit and I have seen many examples of deserving students benefiting from the HEC’s policies”. It is important to note that Pakistan had made remarkable progress during 2001-2008 in higher education and there was a 600 per cent increase in scientific publications in international journals and a 1,000 per cent increase in citations in this period. The speakers at the protest warned of disastrous impacts on research growth of the country if HEC is devolved to the provinces. 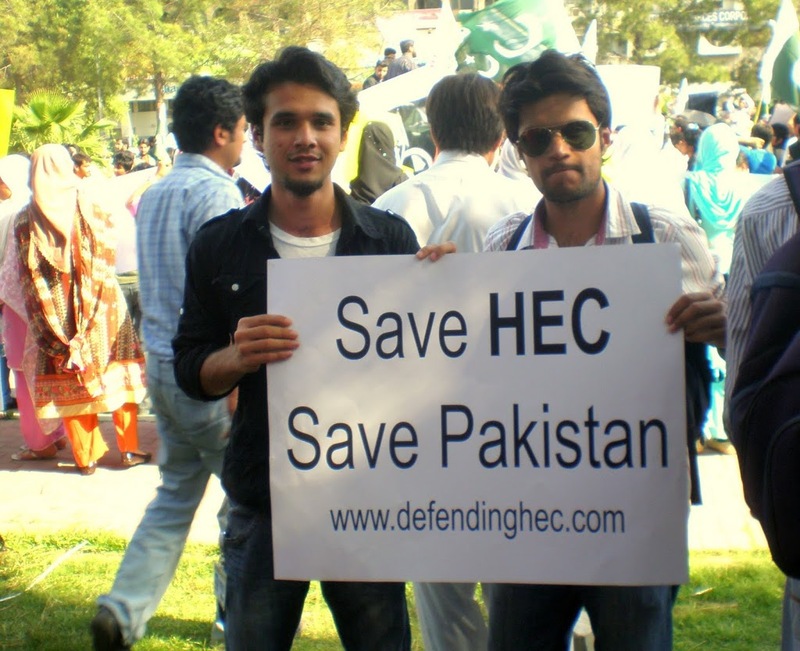 “We are not against government, but against the devolution of HEC” said Saira Khan, a student of History at QAU. “It is time we should separate politics from educational system if we want to develop as an educated nation” she added.